The invention relates to a composition, particularly in the form of liquid to be used externally as a rinsing contact lenses, containing nanocrystalline photocatalyst active in visible light, and optionally hydrogen peroxide. Titanium dioxide based materials are commonly known as photocatalysts of environmental and biomedical relevance.Photoactive TiO2 irradiated with ultraviolet light shows antiseptic, fungicidal, disinfecting and odour-neutralizing properties. It can be used for production of self-cleaning surfaces as well as disinfection, sterilization or odour-neutralizing agents. Experimental tests of the bovine serum albumin photodegradation and Escherichia coli photoinactivationconfirmed a high photocatalytic activity of the modified nanocrystalline titanium dioxide under visible light irradiation conditions. Further development of the invention is under progress at Faculty of Chemistry, Jagiellonian University. Currently the Centre for Innovation, Technology Transfer and University Development (CITTRU) is looking for entities intrested in the licence and commercial applications of the described materials. 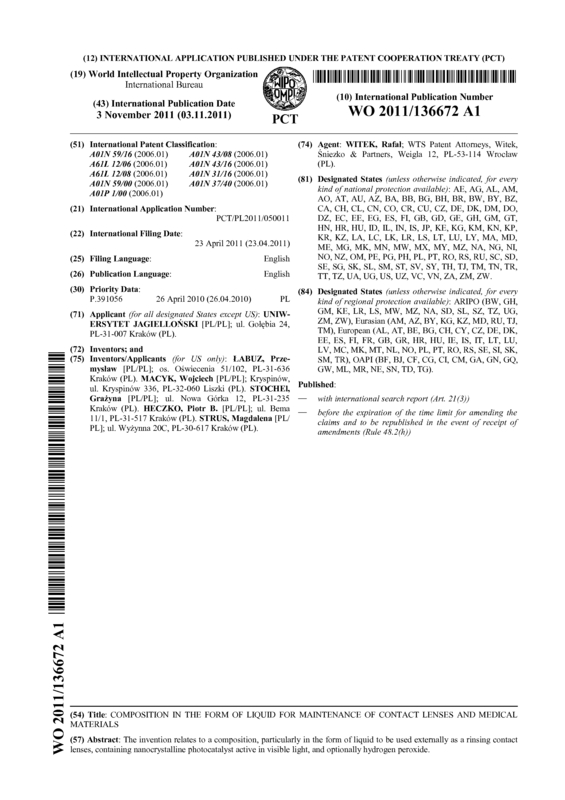 Page created at 2019-04-25 14:35:06, Patent Auction Time.